Dr. Rani Athreya is a Board Certified Neurologist, specializing in Movement Disorders and Board Certified in Sleep Medicine. After completing here under graduate education at Madras Medical College , a renowned medical school in India, she underwent Internship at Brookdale University Medical Center in New York. She received the “Best Intern” award and completed her Neurology residency at Downstate Medical Center, SUNY - Brooklyn, NY. She continued her training as a fellow in Movement Disorders at University of Massachusetts and later settled in Western Massachusetts. She worked as a Consultant Neurologist and Movement Disorder Specialist at Baystate Medical Center from 2005 to 2012. Dr. Athreya is also an Assistant Professor of Neurology at Tufts University School of Medicine and continues to enjoy teaching medical students. In 2012 , she founded Pioneer Neurology and Sleep and serves as the President. 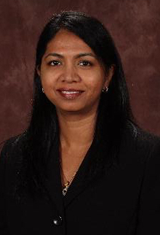 Dr. Rani Athreya is a member of American Board of Psychiatry & Neurology, American Board of Sleep Medicine, American Academy of Neurology, American Academy of Sleep Medicine, Movement Disorder Society, and she is licensed to practice Medicine in the state of Massachusetts. Kristie Harrington is a Board-Certified Family Nurse Practitioner. After an extensive 18-year history of nursing practice, she earned her Master of Science in Nursing from MCPHS (Massachusetts College of Pharmacy & Health Sciences) University in 2016. Since she has practiced at Pioneer Neurology & Sleep. She is dedicated to working with patients with both neurological and sleep disorders in a comprehensive and holistic manner. She is an active member of the American Academy of Neurology and the International Parkinson and Movement Disorder Society (MDS). She also enjoys teaching and precepting Nurse Practitioner students, and currently serves as Clinical Faculty for MCPHS University.